Airwolf is a futuristic action adventure about an awesome billion dollar helicopter equipped with a twin-turbine drum rotor system capable of propelling it to 300 knots, plus fourteen firepower options. 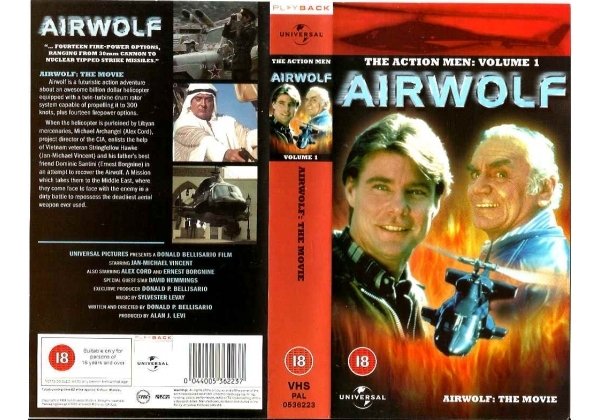 When the helicopter is purloined by Libyan mercenaries, Michael Archangel (Alex Cord), project director of the CIA, enlists the help of Vietnam veteran Stringfellow Hawke (Jan Michael Vincent) and his father's best friend Dominic Santinl (Ernest Borgnine) in an attempt to recover the Airwolf. A mission which takes them to the Middle East, where amidst the violence and destruction, they come face to face with the enemy in a dirty battle to re-possess the deadliest aerial weapon ever used. ©1984 Universal City Studios and Bellisario Productions. Or find "Airwolf: The Movie" on VHS and DVD / BluRay at Amazon.